TNCS offers fun and engaging camps for children from age 2 years through 8th grade. Both current and non-TNCS students are welcome to enroll. 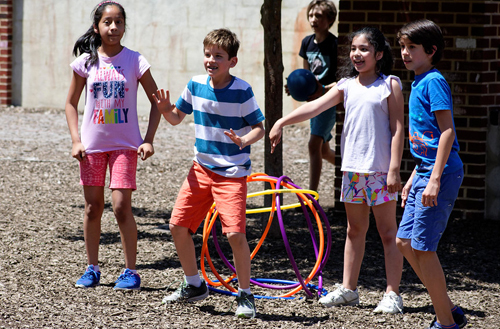 Learn more about camp offerings for elementary and middle school (grades K–8), primary (ages 3–5), and preprimary (ages 2–3) students. An overview of our line-up of programs for summer 2019 is provided below. Summer sessions at TNCS are filled with laughter, world languages, and exciting academic adventures unlike any other! Summer Camp runs for a total of 9 weeks. Dates are as follows. There is no camp on July 4, 2019. Running Monday through Friday (except holidays), each week offers something new in our dynamic and challenging summer camps. Ages and grade requirements vary by camp. TNCS offers Before Care beginning at 7:30 am as well as After Care until 6:00 pm. Let us provide school lunch! You can sign up your child for our healthy, delicious vegetarian lunch. My daughter really enjoys the variety of elementary camps TNCS offers. From learning new painting techniques to taking photos around Fell’s Point, her camp days are always full of summer fun! Spanish Immersion Camp 2018: Fun Times! Tiempos Divertidos! American Music System Summer Camp Comes to TNCS! TNCS Chinese Immersion Summer Camp 2017! TNCS Spanish Immersion Summer Camp 2017! Kids Brush up on Creativity at TNCS Summer Camp with the Painting Workshop! Kids Get It Together at TNCS Lego Camp!